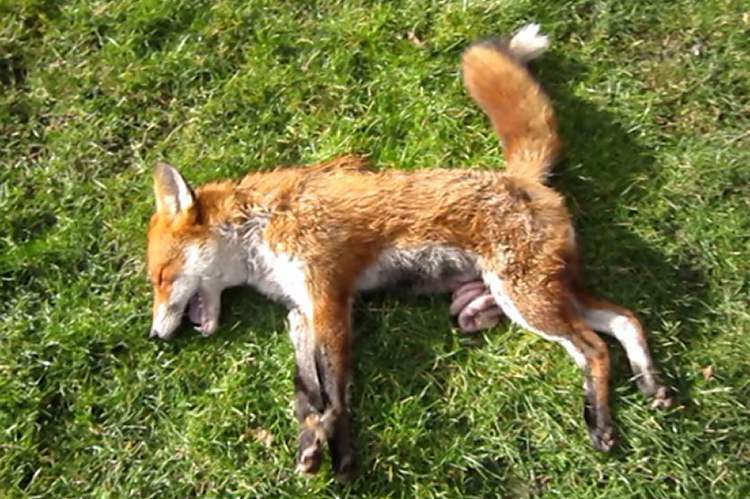 Police are investigating claims that a fox was killed in a hunt hosted by David Cameron’s father-in-law. Hunt protesters clashed with the York & Ainsty South Hunt amid claims that eight hounds chased and killed the fox after setting off from the 18th Century country estate of Sutton Park, in North Yorkshire, owned by Samantha Cameron’s father Sir Reginald Sheffield. The hunt saboteurs allege that a member of the hunt – the ‘whipper-in’ whose job it is to keep the pack of hounds together – tried to take the animal’s lifeless body away but fled when a protester came across the scene. Afterwards, the Hunt Saboteurs Association, who had been monitoring the hunt on Saturday, February 21, posted gruesome photos of a dead fox dripping with blood on social media. The hunt had met at the home of Samantha Cameron’s 68-year-old father, in the village of Sutton-on-the-Forest, before setting off on a legal ‘trail hunt’. Last night a spokesman for the hunt claimed the fox had not been killed by its hounds. But hunt saboteur Jay Gillette, 20, said: ‘We were following the huntsmen through a woodland, and then the hounds started to cry, which means they were on the scent of a fox. ‘So we did our best to put them off – we used horn calls to try and stop them from chasing the fox. We use the same horn that a huntsman would use. ‘I then saw a fox bolt along the edge of the woodland so I raced over that way. The best way to stop the hounds from following is to get in between them and the fox. Once I got to the fence where I saw the fox run past, I saw about eight to ten of the hounds in a semi-circle and a whipper-in. ‘She was in the semi-circle with the hounds. I couldn’t see what she was doing but I believe she was trying to pick up the fox and take it away so we couldn’t see it. ‘The whipper-in then took the hounds away as soon as I got there, leaving the fox. ‘After that, none of the huntsman would talk to us. They went quiet and just carried on – moved off with the hounds to the next woodlands. In 2004, Tony Blair’s Labour government banned the hunting of wild mammals with dogs. Instead, hunts now follow the trail of a scent. Sir Reginald Sheffield was not available for comment.